Festival of Military History Reconstruction "Dinaburg 1812"
The International Festival of Clubs of Military History Reconstruction “Dinaburg 1812” is held in Dinaburg Fortress (Daugavpils Fortress nowadays). This festival is devoted to the events happened in the 19th century and it is filled with the spirit of that epoch. It introduces its spectators to the uniform, ammunition, battle procedures, dress and dances of that time. In 1810, when Dinaburg was part of the Russian Empire, on the Russian Emperor’s Alexander I edict, the construction of the fortress for defending Russia’s western borders was started on the banks of the Western Dvina River (in Latvia this river is called Daugava). After two years the war between the Russian Empire and Napoleonic France began. In Russia this war is known as the Patriotic War of 1812. It was planned to complete the construction of Dinaburg Fortress in a year. However, the war set its own rules, and in July 1812 first sounds of cannons echoed around. The fortress garrison stopped the attack of the French corps, despite the fact that the number of French soldiers more than 10 times exceeded the number of the soldiers in the fortress. The Festival “Dinaburg 1812” is held in the fortress. It starts with a parade during which spectators may see the uniform of Russian and French soldiers, armor, military marches, 19th century dress, etc. Soon after the cannon shot at midday, the reconstruction of the battle at the fortress walls begins: attack, defense, ambush, close-in combats, etc. As a rule, there is a battle painter somewhere not far to paint each episode of the battle. The attempts by the French to conquer the fortress fail, and after the victory of the Russian army the celebration starts. There is a ball held in the Fortress Garden in honor of Natasha Rostova – the main character of Leo Tolstoy’s novel “War and Peace”. The Ball’s participants dance and demonstrate their amazing dresses. After the Ball, everyone is invited to attend the ethnic music concert. The festival finishes with the fire show. During the festival visitors can attend a lot of attractions, or do the shopping at craftsman and antique fairs. They can also take lots of fantastic pictures with war symbols and attributes. 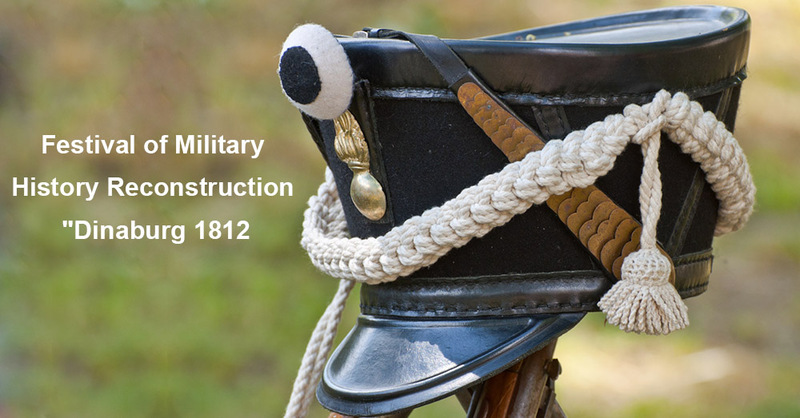 The interest in the festival of reconstruction “Dinaburg 1812” is growing every year. In 2017 the representatives of 13 clubs from 7 countries participated in the festival, and the number of guests was about 11,000 people. You are very welcome to the festival!